My cousin J is having a baby in December. This is storming news. I’ve always loved and admired her very much so obviously the baby must have a very superior knitted something. It’s a pattern by and designed for yarn from The Natural Dye Studio, which is all absolutely beautiful. However from my point of view there were a couple of problems. Firstly the pattern didn’t say how much yarn in total was required and secondly how many different colours were used. 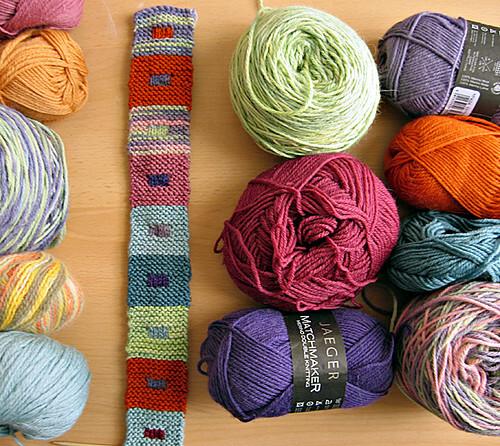 The first was simply remedied – I asked to weigh the finished blanket and discovered it was 560g. But as to the second… it was obvious that a very large number of different colourways had been used, but with each 100g skein of alpaca/merino retailing for (a perfectly reasonable) £10.99 the cost of making something similar was rapidly going to become totally prohibitive. Luckily I had to hand a top advisor (and “enabler”, aka pusher) in the shape of Pixeldiva and a compromise was reached. I purchased three skeins of the luscious alpaca/merino and made up the rest from my (extensive) collection of random balls of similar-weight yarn. So I ended up with 12 different balls of yarn to make a blanket of 15×12=180 squares, each requiring two colours. The next challenge was distribute the different colours evenly across the grid. I know for certain that it’s definitely got to be worked out in advance (making it up as you go along is a recipe, or rather non-recipe, for disaster) and I also know that I’m not very good at keeping my pet colour combination preferences from dominating the mix. Knitting comes under the “art” category of course. The blanket is constructed in 12 strips of 15 squares each (which will be sewn together) giving a total of 180 squares requiring two colours/numbers each. I allocated a number between 1 and 12 to each of the yarn colours. What I needed was 180 random sets of two numbers between 1 and 12. So I went to the integer generator and asked for just that – set the total of numbers required to 360, set the integers to be used to any between 1 and 12 and ask for the output to be generated in two columns. I had, of course, to tidy it up just a teeny weeny bit because I didn’t want to have squares with the same colour centre as border. Nor did I want two adjacent squares to have the same border colour. But it was the work of a few minutes to eliminate these results, generate a few more numbers to replace those removed, and then slip the whole lot into a 12×15 spreadsheet. This makes me almost unbelievably happy. Firstly because I’m deeply sad geeky, secondly because it gives the knitting (which is very very simple) a level of interest to keep me motivated – finding out what each square is going to look like and how it relates to all the others as I go along. There are, however, a couple of drawbacks to this otherwise very satisfying project. The first is the necessity to cart around 12 balls of wool at all times thus making the project less than totally portable. The second is the humungous number of ends which will need darning in. Six ends per square, 180 squares… that’s… that’s… 1080 ends! Greater love hath no woman than that she darn in any ends, never mind more than a thousand, for her friend. Meanwhile in other knitting news there are two satisfied customers – Fresca loves her Jayne so much she’s prepared to risk sautéed brain disease by wearing it in 76 degrees of heat; 2ndSon loves his birthday socks so much he’s wearing them literally day and night and contracted extreme smelly feet disease. I’ve had to remove them by force to wash them. May I just point out that your geekery is impressive? And I would like to be that fortunate baby – what a great project! Krista today at lunch swore on the Jayne hat that she was going home to work on the Pi scarf! So I have done a good deed in a sad/naughty world. That baby blanket is/will be astonishing. And my brain is as yet undamaged. I think. It’s true about La Fresca — she was wearing her hat today at lunch and positively glows with love for it. (As she should, because it is smashing on her.) I wore a 3/4 sleeved t-shirt and jeans. Fresca wore a shirt under a linen coat and the hat. I can report that she looked very much herself. Oh, fab blanket, gorgeous – what a very special present it will be! If you line it, surely then you won’t have to sew thends in or not so carefully anyway? If I had those socks I wouldn’t take them off either. If I had a brain like yours that could translate that spreadsheet into a baby blanket I’d… be very happy too. Thanks! It’s coming along nicely, actually. 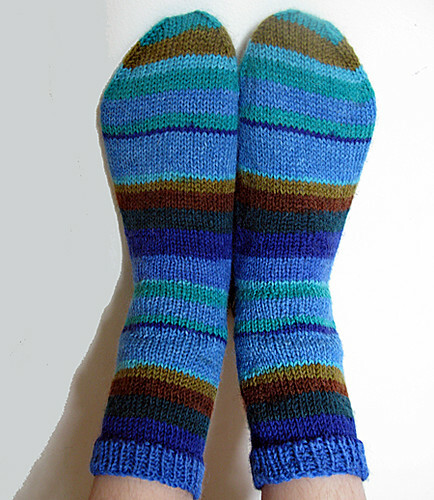 Two strips completed *and ends darned in*!!! Frisca/Kresta (for thus you shall be known, empaired) – hurrah! Jean – yes, I think you’re right. There’s something very powerful about hand-made things, particularly in these times of cheap mass production. Kirsty, do you think your s-i-l would fancy some extra end-darning? I’m a bit far away for babysitting though. Lucy, there was much discussion about lining among the wise ones of the I Knit group. Problem is I’m a cussed perfectionist. Blankets shouldn’t be lined and they shouldn’t (as far as possible) have a “wrong” side. Which is why I’m doing intarsia (new length of wool for each block of colour) and darning in ends rather than just stranding across the back (which was how the original blanket was done). I think also it’s going to be too small to line – it looks like it’ll be a very petite 60 x 65 cms and a backing would make it too thick (imho). But we shall see. I might get so utterly sick of the darning business that I’ll change my opinion entirely at a later date 🙂 Oh, and I’ve got absolutely no idea what “metroness” is.